I can’t believe it is already November and the year is almost over. 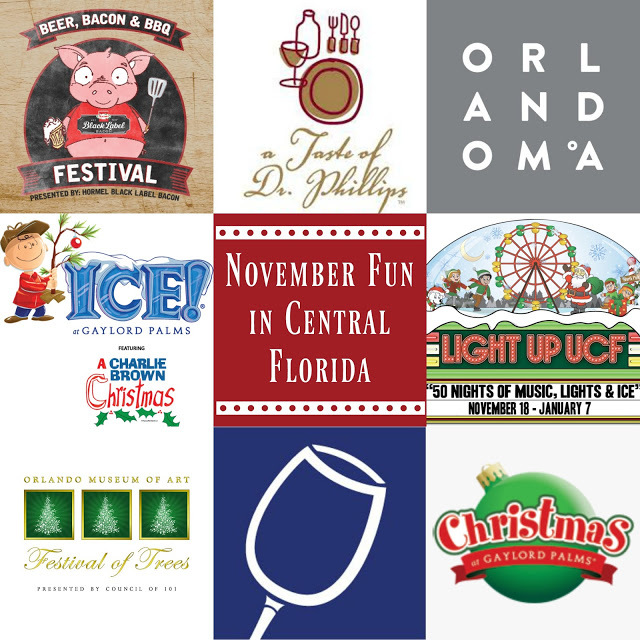 Time goes by too quickly, but here are a few fun ways to celebrate your November in Central Florida. The Beer, Bacon, & BBQ Festival will pay homage to the glorious pig and the tastiest craft brews! You can sip your way through the festival with over 40 craft beers and some of Central Florida’s most delicious restaurants will be offering their best bacon and BBQ inspired eats! Food will be sold on-site separately from the ticket through cash/credit purchases and range in price from $2-$6.Ticket prices increase at the door the day of the event. A Spectacular Celebration of Global Cuisines, Music & More featuring international foods at 30 unique kiosks, Eat to the Beat concert series, culinary demonstrations and seminars, and celebrity chefs. Valid park admission required. Our 10th annual A Taste of Dr. Phillips is sponsored by Dr. Phillips Rotary Club. Admission to the event is all inclusive and includes food, wine, and beer from over 20+ of Orlando best restaurants. Alcoholic beverages are included in the admission price, so the event is for guests 21 years of age and over. Proceeds from this event will be invested back into the community to organizations like, Dr. Phillips High School Scholarship Fund, Dr. Phillips Hospital, Dr. Phillips Library, Dr. Phillips Foundation, and other Dr. Phillips Rotary Charitable causes. This annual event, now in its thirtieth year, transforms the Museum into a glittering wonderland filled with sparkling trees, vignettes and stunning décor for visitors of all ages. Special activities include A Night in White Gala, musical performances and delightful programs for seniors and children. Trees, wreaths, gingerbread houses, decorative accessories and gifts for home or office are available for purchase. With the support of business partners, sponsors and volunteers, Council of 101 offers the Central Florida community an opportunity to experience the joy of the season as well as support the Orlando Museum of Art. Tickets include admission to current Orlando Museum of Art exhibitions. New for 2016 is ICE! featuring A Charlie Brown Christmas by Charles Schulz. Watch Charlie Brown rediscover the true meaning of Christmas as the beloved classic story unfolds through interactive ice sculptures and displays. Experience the Peanuts gang in iconic scenes such as their holiday play rehearsal, Snoopy’s decorated doghouse and Charlie Brown choosing the perfect Christmas tree. Everything is hand-carved from 2 million pounds of ice! ICE! is an indoor winter wonderland featuring a walk-through holiday attraction kept at 9 degrees, four ice slides, a live carving zone, breath-taking Nativity scene carved from crystal clear ice, and much more. Please read the FAQ’s and dress appropriately for the weather. Closed toe shoes is a must! As part of Small Business Saturday, nationwide effort to support small businesses this holiday season, the Winter Park Chamber of Commerce and Park Avenue Merchants Association invite you to sip, stroll and experience the charm of the small businesses that call Park Avenue home. Spend the evening on a unique wine walk and stroll to your favorite locally-owned shops and restaurants. Discover new merchants, check out the latest fashions, gift ideas and seasonal menus. Enjoy wine and hors d’oeuvres along the way. Event held at participating locations from 5 – 8 p.m.
Light Up UCF offers a free holiday light show, free outdoor Holiday Film Festival, and Orlando’s largest outdoor skating rink! For the 2016 season, Light Up UCF is offering all the favorite rides and attractions, including the Winter Whirl! Parking is FREE and ice skating tickets are just $12! Tickets can be purchased at the CFE Arena Box Office or in advance online. Images for collage from websites associated with each event.